A giant sea monster known as "Dragonsaurus" has emerged from out of nowhere, terrorizing the depths of the oceans. 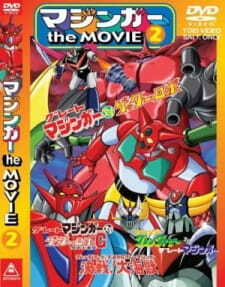 Great Mazinger, Grendizer and the Getter Robo G team join forces to combat the new threat. But their task becomes more complicated when Dragonsaurus swallows up Boss Borot and makes its way toward Tokyo. I decided to watch this as a soft introduction to UFO Robo Grendizer, which has yet to be fully subbed. Well, at least not by people who speak English. Getter Robo G and Great Mazinger also aren't fully available yet as far as I know, but I'm more familiar with their respective franchises. In this 30 minute crossover movie, the aforementioned main characters team up to tackle the deadly DRAGONSAURUS... which looks neither like a dragon nor a dinosaur. It's more like a giant jellyfish with a face and sea serpent hydra-like heads instead of tentacles.But hey, in this universe Japan's greatest scientists aren't known for their etymology skills but rather for creating the "world's most powerful robot army". You'd assume there wouldn't be much competition if Texas Mack is anything to go off of, but hey, they're our only defense against the Dragonsaurus which literally eats oil tankers like crackers. The Dragonsaurus is specifically after Japan's oil in the vein of classic not-so-subtle environmentalist kaiju monsters. There's a line thrown aside by one of the scientists that this is humanity's fault for dumping oil into the ocean. A pretty immoral practice in any case, but I'm not so sure they really deserve the blame for this one. It's not like the Dragonsaurus didn't exist until oil got dumped into the water, and it's reasonable to assume no giant monsters or living creatures of any sort would live off oil but hey whatever. And oil has no mutating powers. Whatever the reason, Dragonsaurus was there, now it's here, and it's famished for fossil fuels. Crossover aside, this is completely classic mecha action. This means a lot of our heroes getting slapped around as they call out the names of each of their attacks that do nothing to the Jellyhydrasaurus. Boss Borot makes a special guest appearance here but only manages to get himself eaten. The highlight of the movie is when Great Mazinger enters the monster's stomach to save him and for some reason the entire place is bathed in a rotating rainbow light. Diana A and Venus A appear as well and shout "lady robots can fight too!" but as always end up doing absolutely nothing. It takes until the end of the movie until our heroes realize that since the monster is a living oil keg that they could just kill it by tossing a lit match down its throat, but naturally they go for a much more grandiose explosion because that's what would make this job worth doing. Anyway, eh... even in the context of its era, "Grendizer, Getter Robo G, Great Mazinger: Battle! Giant Sea Beast" doesn't particularly stand out. As far as I know no additional lore is developed here like in Great Mazinger vs. Getter Robo which introduced GilGilGan, who would make several Super Robot Wars appearances. (Edit: I was incorrect! Dragonsaurus does make some SRW appearances, just not in any I've finished.) The culled cast from each series almost don't interact with each other, and when they do it's in the context of their work and nothing personal to develop a relationship between them. So it all feels like a standard monster-of-the-week episode that just happens to feature more attacks than usual in one place. The animation is fairly fluid for a 1976 anime but otherwise not spectacular, and the score is the usual other than the cute, short original theme song written for the movie. I generally don't go for this kind of mecha anime, and if you do you don't really need my opinion to know that you can't get enough of this stuff. Thank you to /m/subs for allowing us all to watch this in such great quality, and the subs themselves are pretty much perfect. If by chance any of you are reading this, I hope some day you can find time to transfer your subs to the Layzner blu-rays. It looks like a great series, and I'm holding out for it! Well, that's about enough. This crossover is all of the first things you'd probably expect.